Dear SAP HANA DBa’s, developers, architects etc, we at Just BI released Shivers. Shivers stands for SAP/HANA Information Viewers. 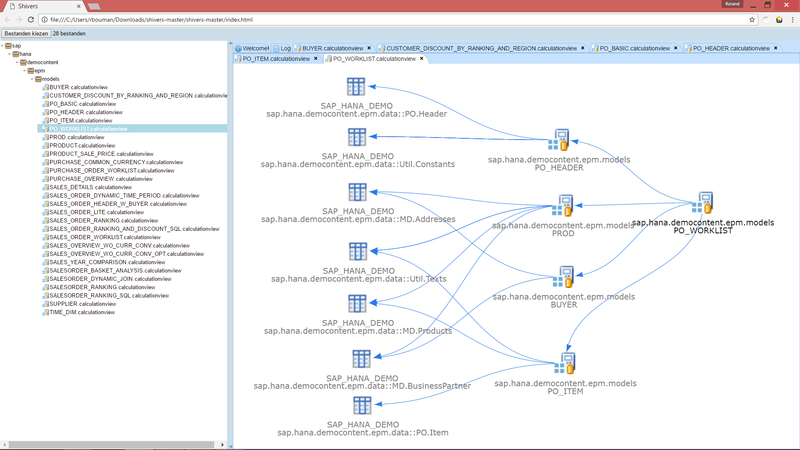 It is a tool to analyze and visualize dependencies between SAP/HANA information views (that is, Analytic Views, Attribute Views, and Calculation Views) and catalog objects (such as tables and views). Note that you do not need to install shivers on a web server or HANA XS server. It runs directly from your local disk in your browser. Of course, you can install Shivers on a webserver or HANA XS server if you like, and then you can open Shivers by navigating to the url corresponding to the place where you installed Shivers. But this won’t affect how Shivers works. On the Shivers toolbar in the top of the application, you’ll find a file chooser button. When you click that, a file browser will open. Use it to browse to whatever location on your local disk where you keep your information view source files. I for example have my HANA Studio workspace stored in C:\Users\rbouman\hana_work, so I browse to that location and then find the appropriate path in the subdirectories to the HANA System and package I’m interested in. When I found a directory containing information view source files, I selected them, and confirm the file chooser. When you are done editing your graph, you can right click it, and choose “Export Image” to export the visualization to a png file, which you can then use in your technical documentation or knowledge transfer presentation slide deck. HADES are server-side tools (so far, only stored routines) that help analysis of information views. HADES is data-oriented, and requires access to a HANA SQL client and allows you to extract just about any information you’ll ever want to know about your information views. But, HADES is in a way also very low-level, and using it effectively requires SQL skills. Shivers is a graphically oriented client-side tool. It is implemented as a web page, that you start in your browser, directly from your file system. Shivers does not require any connection to a HANA Server. Rather, you use checked out information view source files (.analyticview, .attributeview and .calculationview files), load them into shivers, and then the tool does static code and dependency analysis. So far, possibilities to extend or influence reporting of Shivers are very limited. Shivers draws dependency graphs of your information views, and for now – that is it. Implementing Shivers as non-server, client side tool was a very deliberate decision. At our customer’s systems, we cannot assume that we are allowed to install our tools on the HANA Server for just any purpose. So we really must have a solution that works regardless of that. What we can assume is that we have access to the information view source files, since we mostly work with HANA Studio and check out information view source files from the HANA repository all the time. Shivers is open source software under the Apache 2.0 License. This should give you all the freedom to copy, use, modify and distribute Shivers, free of charge, provided you respect the Apache License. Good work and great to see (non-SAP) Open Source projects around HANA! Heheh, yeah I posted it in a few places, sorry for the spam 🙂 Thanks for the kind words of encouragement! I hope it will be useful. I could swear that I answered a question around the dependency_type column and a supposedly superfluous reference calc. view in stackoverflow (I think). The question had a very similar screenshot and the OP mentioned to be working on a tool… that wasn’t you or a team colleague by any chance? Looks interesting just like the other tools and tricks you introduced us to in your previous blogs. Unfortunately I cant use it on my client laptop…but will surely try it out with my HANA trial account. Hi Benedict, thanks for your comment. Do you mean you can’t use it on your client laptap because you’re not allowed to install anything on it? Or do you mean you installed it but it won’t run? If the latter, then please file an issue on the issue tracker, I will gladly look into it. Thanks in advance! Thanks Roland. It was the former :), I am not allowed to install softwares. i will try this out in my personal laptop and surely leave you a comment. This a great contribution to HANA developers, thank you very much. Where can I report issues found?